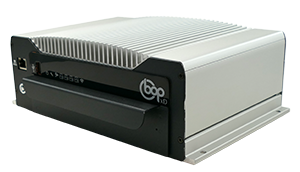 BOP - Best Of Protection video surveillance sytems. Designed specifically for bus, coach, tram and train use, Actia's BOP CCTV systems are tailored to the onboard security requirements of the vehicle operator: to protect the vehicle, protect the driver, and protect the passengers. Many thousands of hours of Actia CCTV footage have been used as evidence in cases of anti-social behaviour, vandalism and contested insurance claims. Indeed, our customers report an incident capture rate in excess of 95% using BOP. With a range of formats to suit your application and budget, BOP is a truly flexible system, with multiple connectivity which allows for adaptation and upgrade during the life of the vehicle.